Another side note since this is it's first appearance in an outfit: this amazing camera bag from Jo Totes that you've seen in many of my monthly wishlists is finally mine!! I love it to itty bitty pieces, and use it everywhere I take my equiptment these days (which is just about everywhere). Also I'll be doing a What's In My Camera Bag very soon, so be sure and leave any questions you may like me to answer in that post! We've been making great progress around here in and outside the house, and I'm happy to say with all this progress that per-your-request there will be room tours coming to the blog very soon! I'm loveing these little renovations you guys, and I can't wait to show you:) I hope you've been having a great week so far, and I hope you come back here tomorrow for something extra fun! I'm always drawn to gray and pink! 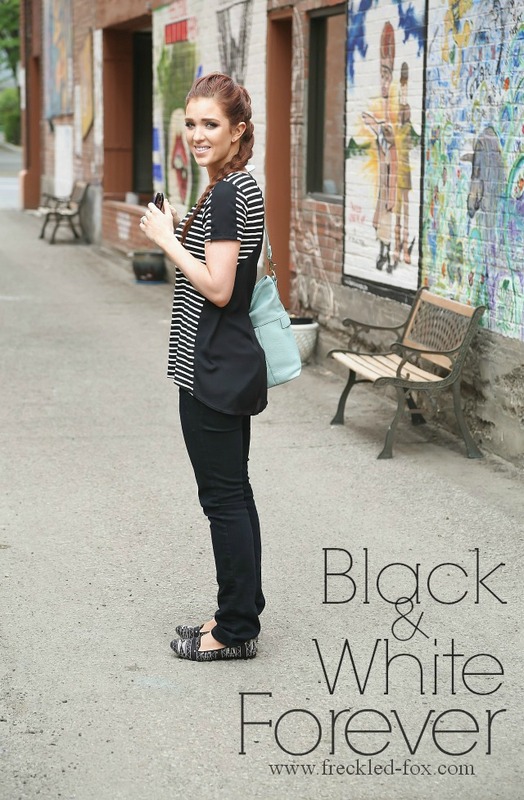 I love the striped black and white top! I'm with you, black has always been my go-to color as well. This is so pretty :) I love to see you in ballet flats! I always buy blue. Always. And I am particularly susceptible to the purchase of blue and white striped shirts, or dresses, or shoes...anything navy striped. This works well most of the time, except I also enjoy orange and green, which isn't nearly as prevalent in my wardrobe. Blue is my go to color, I'm always drawn to it and have to make an effort to choose a different color if a piece of clothing is offered in several colors. However I also love black, I've almost decided to weed out all the brown in my wardrobe so that I only need shoes that are complimentary to black! This top is so cute, I love the detail on the shoulders! You are very creative. You always transform an ordinary place to an art place when you take the photos. Really nice the background and of course you look terrific. You always look SO good, Emily! That's just such a perfect blackandwhite combo. I'm a black/white girl all the way...it's so versatile and classy, yet easy and timeless. You really can't go wrong with it! You look amazing! I LOVE that necklace, it is so pretty! I love those shoes! Black is my color too. Far too many years being a roadie and wiping my hands on my pants as I go about my day means anything lighter than black gets dirty VERY quickly. The upside is any color we wear with black pops out and looks awesome!